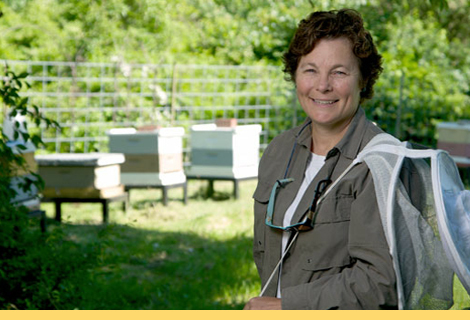 Maryann Frazier has done research on the declining honeybee population in America for years—we actually wrote about her work in our May/June 2007 issue. Frazier ’80, ’83g, a senior extension associate in the College of Ag, is still trying to figure out why these tiny-but-vital members of our ecosystem are dying off. It’s been a difficult process, but recently, members of her research team have stumbled across something hopeful: bees that could be more productive pollinators than honeybees. These aren’t the only bees making an impact on Penn State researchers: Grad student Carley Miller is giddy over squash bees she’s observed, calling them “Wall Street bees” because of how quickly they fly around from one place to the next. There’s still a long way to go before either of these little workers can replace honeybees, but they’ve got these Penn State scientists feeling optimistic. Entry filed under: From the Magazine. Tags: Bees, Carley Miller, Dave Biddinger, Honeybees, Maryann Frazier, NPR. Native/natural ecosystem impact of “Japanese orchard bees”???? ?